No. not another word. Instead I’ll share some of the summer weather with you all in the form of tropical breakfast cookies! This is the first recipe I’ve made in Australia and of course it had to be a summer-y type recipe because that’s totally what I’m feeling like since being here. These are packed with yummy tropical flavors and are so simple to make. One bowl, a few measuring spoons, and just minutes of prep. 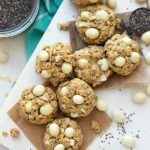 One of my favorite ingredients in these cookies are the Greek yogurt covered dried cranberries. Do not leave them out! They are absolutely delicious in these cookies and with the other ingredients. The coconut extract also adds a lot, but feel free to increase or decrease the amount of that extract to your preference. 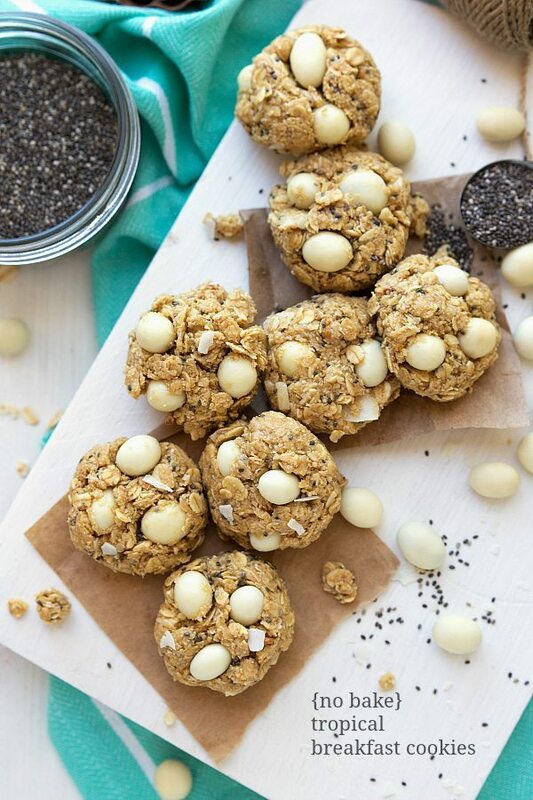 The chia seeds are optional, but I love ’em in these cookies – they definitely add a lot. Not to mention their nutritional benefits! Mix together all of the ingredients until well combined. If needed, add a little bit more honey or peanut butter if the mixture is too dry or more ground flaxseed if too sticky. Place in a sealed container in the fridge for 20 minutes. 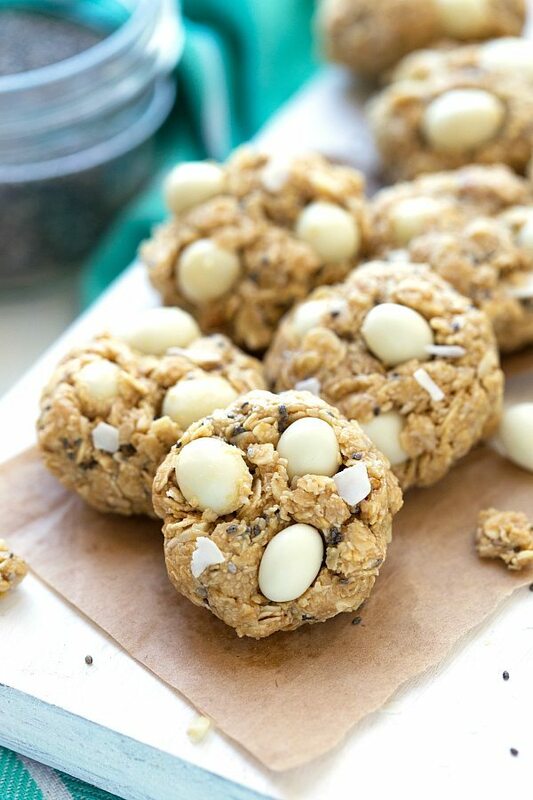 Remove and squish into (rolling doesn't work too well) cookie balls. I like to store these in the fridge, but they are fine at room temperature in an airtight container. Still totally jealous of the move. These look delicious! I haven’t seen those yogurt covered cranberries – gotta look for them! Your weekend plans sound so fun. Have a great time. It’s way too cold here so I’m hibernating. I’ll snack on these tropical cookies and pretend I’m in Aruba! I love no bake recipes, these cookies look awesome! definitely going to give them a try! AH I can’t even imagine swimming and sunshine right now. JEALOUS! Also, one of my favorite snacks is yogurt covered raisins so these fun little cookies look awesome! 🙂 Pinning! 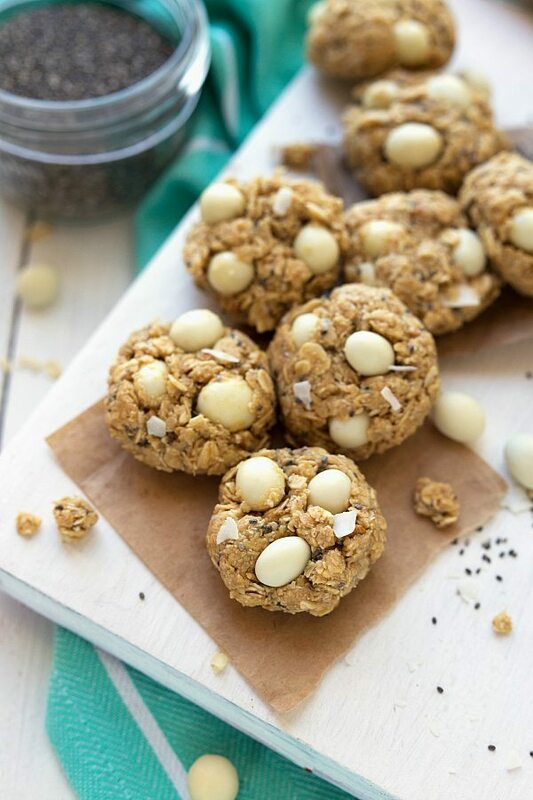 I absolutely love no bake cookies! These look fantastic! Can’t wait to try them! Isn’t Australia amazing!? I have family that live on the East coast near sydney. My mom grew up in sydney so I have always loved the Aussie way. Congrats on the move and I hope you’re enjoying every bit of it. I can tell you already are. It’s evident in the tropical goodies! SO jealous of your second summer! 😉 I hope you’re really enjoying it for all of us back here in the wintery states! And oh my gosh… Yogurt-covered raisins (or anything really) are my weakness. My friend’s mom once bought me a huge bag, and they barely lasted 24 hours… Oops! 🙂 Pinned! I am cooking and baking (and no baking) my way through your website- a bit Julia & Julia…every single recipe i have made have been a hit with my family. I made these AMAZING cookies this weekend and they got gobbled up- i will say-i love yogurt covered anything-but there is such thung as too much of a good thing- i doubled your amount and it was just too much. Tonight is cajun chow mein…i cannot say thank you enough for revitalizing my kitchen and making me excited to cook!!!! I am sharing your recipes and website with lots of mamas-so easy and so good-!!!! Thank you from the bottom of my stomach and my heart! I am SO trying these!!! yummmm and healthy! perfection! PINNED!